In Making Sense of the Bible , Adam Hamilton brings sanity back to the Bible wars. With clear explanation and compelling exhortation, he explains the doctrines of canonization, inspiration, and inerrancy in ways that make sense and liberate the Bible from the theological shackles in which we have bound it. In the end, Hamilton shows that the Bible is much more than what we’ve been led to believe. As I finished the book, it gave me a new hope that the Bible is for today, and that God can speak to me through the pages of Scripture. Yet it did this by arguing against the traditional doctrines of inspiration and inerrancy, showing that the way these doctrines are taught today was not the way they were understood in the early church, and is not even what Scripture says about itself. Yet this does not mean the Bible not inspired, or that the Bible is hopelessly full of errors and cannot be trusted. Far from it, Adam Hamilton shows how we can trust the Bible, and how the Holy Spirit breathes life into the Bible so that we can understand it for today. Best of all, this book closed with several chapters on pertinent theological questions for today, such as how to reconcile the Bible and science, how to understand the violence of God in the Old Testament, and how to make sense of what the Bible teaches about women, homosexuality, and the fate of those who have never heard the gospel. The pastoral heart of Adam Hamilton really comes out in the book, and if you have ever had concerns about “going down the slippery slope” by giving up the belief in the inspiration or inerrancy of Scripture, this book is an excellent source to see how someone can abandon these and still hold on to their faith. In fact, this book helped me see that giving up the traditional understandings of these doctrines can actually help strengthen one’s faith in God and aid one in following Jesus more closely. 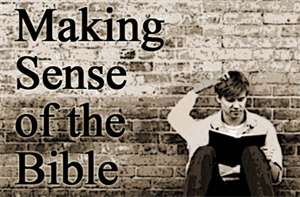 I highly recommend Making Sense of the Bible . Do not blaspheme the lord.pray that your blind eyes see just as he made mine see,God almighty,holy,beautiful,perfect loving God. Did I blaspheme God in the post? What are you referring to? Perhaps I got you wrong here, Jeremy. If so, please, correct me without hesitation. If we are honest, everybody has had several struggles regarding their faith, be it about doctrines or other theological issues. That seems to me being normal for human beings used to rely on human reasoning. God surely has no problems if we doubt that the Bible were His inspired word. And I fully agree with you that there is nothing more important than ” following Jesus more closely”. However, what then is our criterion that could give us assurance of following the “right” Jesus? There are so many voices around us and in our mind that we need something to cling to if we see our hopes dashed and do NOT know whether we hear God’s voice or another. Of course, if someone is so close with God and Jesus as the apostles and many Christians in the 1st century were, that believer won’t need the Bible in order “to hear” God speaking since he hears the Holy Spirit directly. But how should we discern the voices and sources we rely on, then? Should we rely on our intellectual abilities and our feelings alone? And can we easily drop the following verses? It’s a good question. It’s probably one that is asked by anyone trying to investigate the New Testament for the first time. (I know you are not in that category.) There are so many opinions and interpretations regarding the meaning of Jesus’ life and teaching that it’s easy to get confused and discouraged. To answer that question for myself I decided to focus solely on the reported words of Jesus, to see if I could find an underlying theme in his message. As I’m sure you’ve also discovered for yourself, that theme is love. That is the criterion. If the Jesus being described embodies unconditional love, it is the right Jesus. Since I understood and accepted that, I’ve found that is the only thing I need to cling to. That has become the basis of my own discernment among those voices and sources. Indeed, we should not rely on our intellectual abilities and feelings alone, but neither should we suppress them. I read a preview of Mr. Hamilton’s book on Amazon. From what I read, he is questioning many conventional assumptions, but he’s not attacking the Bible itself, just clarifying it. I doubt that there is any suggestion in the book of dropping those verses from 2 Timothy, or any other verses. I’ve ordered the book and look forward to reading the rest of it. By the time I’m done, I suspect I, too, will be wishing I’d read it 20 years ago. Sorry LUTEK, I wrote my reply as you were writing yours. Forgive my opening remarks below. Susanne, you ask good questions and as you have yet to receive an answer I hope you don’t mind if I try to reply. I will be controversial for sure, but nonetheless, that may provoke your own thought, if only to strongly disagree; or others may jump in to offer you more acceptable answers. All that is good. The Bible, I think, provides many protestant Christians with the raison d’etre for their way of life. It’s authority gives certainty and direction, and acts as a constant influence that guides their actions. This is only possible as long as the Bible has integrity. If parts can be rejected, deemed as not representing God’s heart, then Hamiltonian Christians are effectively putting themselves in opposition to Scripture. Where will that lead? Opposition will inevitably weaken their inner relationship to the Bible, and thus their raison d’etre. This is Hamilton’s goal. Make no mistake: Hamiltonian Christianity will change your way of life. The question is, is it a good thing? Hamilton thinks so. He argues that protestant Christians have elevated the Bible too high. It trips you up. Reverence for the Bible blinds the Christian to God. The Bible is not a candle but a poke it the eye. I think that part of Hamilton’s thesis is right — but I’m not a Christian. I too want Christians to put down their Bible’s and see God as he really interacts with the world. But Hamilton doesn’t tell you how to do that God. He merely wants to weaken your faith in Scripture. That creates a void and confusion, which will need to be filled. Hamiltonian Christians will be dependent on ministry, just like the Catholic church. So I say, Christian friend, Hamilton’s critique of protestantism is right, but beware: don’t replace being blinded by the Bible with being blinded by priests. If you learn anything from Hamilton, make it this: put your faith firmly and only in God. Sorry for my terrible editing. I’m curious about a couple of things, Dumbstruck. You state that you’re not a Christian. You also say you “…want Christians to put down their Bibles and see God as he really interacts with the world.” Could you sum up your own theology in a word, phrase or paragraph ? I’m just interested to know where you’re coming from. I also wonder, have you read Hamilton’s book, or just reviews of it? There are several other youtube videos too. I also visited his website and read a some entries on his blog. I have to watch the pennies I spend on books, but I think I got his thesis from the video. My faith is horrifying if you come from a Christian perspective. It doesn’t have a name. I don’t know anyone who believes the same, so try to relax. And I can assure you, I don’t visit this site to cause trouble, it’s just I too want to talk with folks who want to talk about God. So what do I believe, briefly, although a word of context. As I understand it, Christians and atheists have one belief in common: they both claim you can’t prove the existence of God. If you can’t prove God’s existence then you need a special revelation, hence the chosen people, prophets, Jesus, the church and Bible. Brace yourself. While I think theres a lot of truths in these revelations, overall they tend to become a substitute or idol that blinds you to God. That’s why Hamilton’s theory is quite interesting. For me, that parts right. I think it’s very easy to prove the existence of God. And if you can do that, then you don’t need a special revelation, confined to one people, a geographical location, culture or particular book. To me that idea doesn’t make sense, God has no favorites, and no one can “own” God, like armies going into battle. Okay, if there’s no special revelation by God, how can you know anything about Him? Oh boy, that’s God’s genius. Every spiritual quality, every virtue, is revealed by the hidden God. I don’t hear Christians calling God a genius much, but I’ll tell you, God is unimaginably smart. Thanks for asking Lutek. By the way. I’m going to be changing my nickname from Dumbstruck (I realized it may come across wrongly) to Willow. So if you want to engage me sometime, I’d really enjoy being presented with some tough questions. One thing I’m sure we can agree on: trust God. Thanks for hanging out here and interacting! The more the merrier! And I love your perspective, even if it doesn’t make sense to me (right now). You say it is easy to prove the existence of God. Could you elaborate? Apparently Hamilton’s book comes with glowing endorsements from: Tony Campolo, Jim Wallis, and emergent church icon Brian McClaren. That’s a triple confirmation that reading it would not be a good use of my time. If I relax any more, I might fall asleep! I don’t find any of what you write horrifying at all. I don’t call myself a Christian, either, first, because labels of any sort are confining and misleading – much like the label “God”, and second because I find my understanding of “the Christ” to be quite different from the norm – including Hamilton’s too, I suspect, but that doesn’t necessarily mean he’s not on the right track. I’m curious to watch the video but I’m in the habit of pinching pennies, too, and my satellite Internet connection usage allowance gets used up pretty fast if I start watching lengthy videos, unless I do it during the free, off-peak wee hours of the morning – which I will. Anyway, I agree that it’s easy to prove the existence of God – for yourself. When people say you can’t prove it, they mean objectively, in a “scientific” way. That’s true, at least for now; unless “God” is defined in the vaguest, most general and impersonal terms. Wether Dumbstruck or Willow, you seem like a thoughtful person, and I look forward to chewing on more of your intellectual fodder! Thanks for the generous and friendly reply. I’m looking forward to more interesting discussions with you. One passing thought, I suggest that you can prove the existence of God in a scientific way. As Sherlock Holmes often said, “Eliminate all other factors, and the one which remains must be the truth.” It’s elementary my dear Lutek. How do you know that what you believe is true? Before we can prove the existence of God, we need to answer a more basic question: How can you know that something is true? In a criminal court the standard is beyond a reasonable doubt. In scientific controversy, take global warming for example, it’s the weight of evidence. The global warming debate rages over which evidence is included and excluded, how that evidence is framed, and then how it’s interpreted. To prove something is true we need a higher standard than that, not probably but must be true. Tell me your standard, and I’ll tell you mine. Are you asking my standard for truth? Now we’re getting into philosophy and epistemology. Wow. I don’t have a formal education in philosophy, but I’m pretty sure that must be one of the fundamental philosophical questions. It would take a lot of discussion to treat it properly. It would be a good topic for the forum, though there doesn’t seem to be a lot of interest in that right now. I gave up checking it a few weeks back. I checked again just now, as I was writing this, and discovered that there were a couple of new posts after all – including one from someone who ended up replying to herself because no one else did! Jeremy, is there any way of setting up notifications of new posts on the forum? Willow, if you post your question on the forum maybe we can breathe some life into that venue. “Eliminate all other factors, and the one which remains must be the truth.” That seems reasonable and logical enough in theory, and it probably even summarizes my personal experience of God fairly well. However, if you’re really determined, you can always think of yet another far-fetched factor or explanation, such as matter that comes into existence all by itself, an infinite number of universes in which every possibility has happened or will happen in its own universe, life and consciousness spontaneously arising out of inert matter, etc. None of those are my personal beliefs. I’m just saying . . .
I’m really glad you’re willing to think about this. I’ve found that if you simply explain to someone, especially when it’s a bit strange to them, they normally don’t get it. By encouraging them to wrestle with the issue they really begin to engage their mind. That works much better. Okay, about your objection: all we’re looking for is what we can know must be true. We eliminate all other factors, not by rebuffing a myriad possibilities, but by identifying only things that must be. Don’t the myriad possibilities count as other factors that need to be eliminated? The ones I mentioned, as you probably know, are widely accepted as the preferred explanation by a large number of contemporary scientists. How do you discriminate what must be from what might be? Scientists insist on verifiable and replicable empirical evidence. Yet spiritual experiences are extremely personal and subjective, and don’t lend themselves to scientific method. How do you convince the fundamentalist scientists? In science, experiments are designed to (dis)prove that a theory conforms to valid deductive reasoning. A verifiable and replicable experiment (dis)proves nothing if its reasoning is invalid. The experiment is a means to an end, not an end in itself. It’s really difficult to communicate isn’t it? We all have such different ideas, assumptions, back grounds, awareness. I don’t have the patience. If something must be true, and only it can be true, then it must be true. If something can be true, but other things can also be true, then the something only might be true. Agreed (though those whose faith is scientism might not accept your criticism). But that still doesn’t answer Jeremy’s question, and now mine: How do you prove the existence of God? You say that first, we need to answer the basic question: How can you know that something is true? I would add another basic question: What is the definition of “God”? It seems elementary but there are a variety of answers to that, not all compatible. If we can’t agree on a definition, we certainly can’t prove or disprove God’s existence. Back to the subject of this blog: I watched most of Hamilton’s video but I confess I started to fall asleep – just like in a ‘real’ church! Now I remember why I haven’t set foot in a church for a long time, except for weddings and funerals. Various commenters complained that Hamilton went a bit too far in his theology. I think he didn’t go quite far enough with some of his points. It’s a good start, though. I know what you mean about sermons. I can hardly listen to them any more either. I listen to a few on my commute, but I find I have to play them at double time so it forces my mind to stay alert while listening to the pastor take 30-40 minutes to get to his point. Ha! Willow, My last comment was not in response to your last one but to the one previous to that. I didn’t post it in time. It works well enough where it is, though. I just want to add that I fully understand what you’re saying. I agree with your logic, and I accept your proof because on reflection, I see it is essentially the same as my own. My point is that in order for it to be accepted as proof by those who prefer the far-fetched explanations, you’d have to point out the fallacies in those explanations, one by one. That would be futile because they work from the assumption that God by whatever definition does not exist, so there MUST be yet another explanation. God will probably always be personally optional. That’s another aspect of God’s genius. We don’t need to prove a definition of God. All that we need is that what we prove is sufficient as a definition of God. I think I understand what you’re saying – that defining the attributes of God is secondary to those two points about truth – and I agree with that as well. But maybe I can make my own point in another way. Like someone else once said, when anyone says to me that they don’t believe in God, I ask them to describe the God they don’t believe in. That is a great question to ask. I find that the god which most atheists don’t believe in is a god I don’t believe in either. Very clever guys, but let me set you a challenge: provide a definition of yourself. Take your time, just make it complete. I don’t mind if it takes you a few days, a month, why not a year. include everything, miss nothing out. And when you’ve finished ask your family and friends, and the people you’ve fallen out with if they agree with your definition. While you’re working on this challenge you might want to consider, how much of your definition would someone else need to be able to prove to prove that you exist? P.S. Oh, its worse than that. For the analogy to be accurate its not just your friends and family that would need to agree on your definition-discription, it’s everyone right? So how much of your definition description would someone need to be able to prove, to prove that you exist? There we go. Very clever yourself, to come up with such a Sisyphean challenge! It can’t be done in a few days, a year or even a lifetime, because the details change much faster than anyone could keep track of them. As it happens, Jeremy answered your challenge just yesterday, before you even posed it, in his post on http://www.tillhecomes.org/forums/t/how-would-you-define-god/. I added my own thoughts after that. You might want to check it out. My last two posts were quite inarticulate. I’m sorry Lutek, I was being distracted and didn’t edit before I posted. Still, I’m glad you understood the point well enough. Jeremy’s question on the forum is interesting and so is your reply. However, may I suggest a different approach. Instead of trying to define God — inquire. This is the crux of our conversation. If you inquire what, in relation to God, must be true, you will learn just a few things, but most importantly that includes the proof he exists (by this I mean you will discover that there must be something which has qualities which we ascribe only to God). At this point you won’t know much, but you have the assurance that what you know must be true. That is a solid basis for faith. Assured in the knowledge that God exists, and the few things you’ve discovered above, you can proceed to ask how then God really acts in the world. In contemplating this, you will discover more of God’s virtues, and that they surpass comprehension. As you increasingly grasp God’s virtues, you will learn how to live. It’s a never ending journey: knowledge leads to faith, faith to contemplation, then to inspiration—a path. To think that you can define God is to underestimate the Infinite. God is so wonderful; you can glimpse ever more, and the more you glimpse the more you realize you’ll never understand. Well, I shouldn’t say this will be true for everyone, but God has no favorites, so I am sure that if you seek him out, not blinded by your own, or anyone else’s definition, and I include the Bible, you will have a great and awesome spiritual journey. Lutek, writing this has answered a question I’ve been worrying about. Should I tell? I’ve just realized why I shouldn’t. I know people before me did tell but I didn’t understand why not. Thank you, really. I do think that by answering questions we learn, and I’ve just learnt something I needed to know. The Bible is incapable of defining God, and so am I. I shouldn’t try to share anything. But maybe it’s okay to encourage you to look. Don’t define: inquire. As Lao Tzu wrote, one who knows, does not speak. One who speaks, does not know. I understand that not as an admonition to silence, but rather to humility. Answering questions can be a way of learning. Asking questions can be a way of teaching. Please continue to share what you’ve learned. There’s nothing wrong with that. Problems arise only when a desire to teach becomes stronger than a desire to learn; when we give up sharing for proselytizing. As you so correctly wrote, instead of trying to define God — inquire. Open yourself to God. The answers come by experiencing God. I think that you, Jeremy and I are all in agreement on that. Trying to define God is like trying to put infinity into a box. Still, we need to try to understand each other. That’s what we’re all doing here. I’ve always been a bit of a devil’s advocate. It’s part of who I am. I may sometimes leave the wrong impression as a result, but I think, Willow, that my understanding of God is very similar to yours. Laozi, that’s a man who knew. Please, question away! Especially when your questions are full of grace! You raise good points, and they are my exact concerns. I just now read your comment, but I was talking about this very thing with my wife last night. In fact, I said exactly what you said, “Which is the ‘right’ Jesus”? When discussing inspiration and inerrancy with most Christians, I notice that they understand those terms in a variety of ways, and often assume that they are basically synonyms. I also note that they rarely are aware that the church’s understanding of the terms has changed over the centuries, especially in the last century or so in response to critics of the Bible. Does Hamilton discuss those issues? Click on the link Sam and take a look at the Table of Contents. I bought the book based on that and so far it’s an outstanding read! I must have read hundreds of commentaries on the Bible which I have found useful, especially when placing the events in their time, place and culture. However I still turn back to the truth that it’s not mans intellect that gives us the answers but Holy Spirit. personally I don’t need to know if it was God or man that instigated the death of nations and people’s or individual’s. When God called and saved me 34 years ago I fell deeply in love with Him. I did not need to know the why’s and reasons as I accepted that everything He did was In Love, I did not need my finite mind to rationalise everything. I believe our unconditional love relationship with God and our life style response to that love through Jesus The Christ is what is important and our true reality. While I’m sure the book is helpful I personally would find it a distraction in my walk with God as He reveals His purpose for me on a daily basis. Do I know and understand everything and will I ever, no, do I have to have all the answers, no, because His amazing love for me makes everything sufficient. Constantly questioning everything will inevitably lead to even more questions. When my wife or friends say they love me I don’t question that, I just acceot it because I don’t need to know why. You are absolutely right that questions seem to lead only to more questions. It gets exhausting. Thanks for sharing this book and your thoughts on it, Jeremy. I’m sure many will find this to be a most helpful guide in rediscovering truths in the Bible.